In Berkeley, Calif. a citywide network of bicycle priority streets called Bicycle Boulevards allow cyclists to navigate safely. They are marked by smart traffic management, bountiful traffic calming, and the aura of livability and putting people first, cars second. Among their most unique trademarks are the purple signage and street stencils larger than a car! In this trip to Berkeley, StreetFilms' Clarence Eckerson Jr. talks to advocates and users of the boulevards about their history and benefits. Posted in Bicycles, Traffic Calming. Tagged as Berkeley, Best Practices, bicycle boulevards, Bicycling, bike boulevards, San Francisco, Traffic Calming, Transportation Policy. After watching these Boulevard videos (the one in Portland too) I am wondering why this couldn't happen in NYC? Those stencils are wonderful. Good film. Itâ€™s super to see your film collection. They are very informative and helpful in educating people about our options and the possibilities for better active living spaces. Films like this make a strong case towards improving our health and environment. Keep it up the great work! One of the many reasons I loved living in Berkeley. I used to bike everywhere. It would be nice if NYC implemented some of their techniques for making the city more bike friendly. I also noticed that the buses in the Bay Area are more eco-friendly. 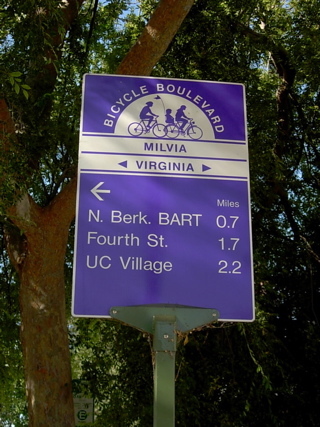 From my experience riding in Berkely, I actually think the traffic calming treatment on Milvia St makes the street more dangerous for cyclists. Rather than winding back and forth in response to the bulbouts, many cars drive in a roughly straight line, crossing over the double yellow and creating a hazard for oncoming bicyclists at the bulbout choke points. Bike boulevards are great, they really are, yeaahh! However, drivers still use their cars on these streets, so I still claim a lane of Shattuck, MLK, San Pablo, etc., much to the chagrin of uppity Steve Jobs dopplegangers in their luxury sedans. A Kryptonite lock hanging off my front handlebars is a great deterrent prop to dissuade them from using their horns and driving up on my stink-wrinkle.